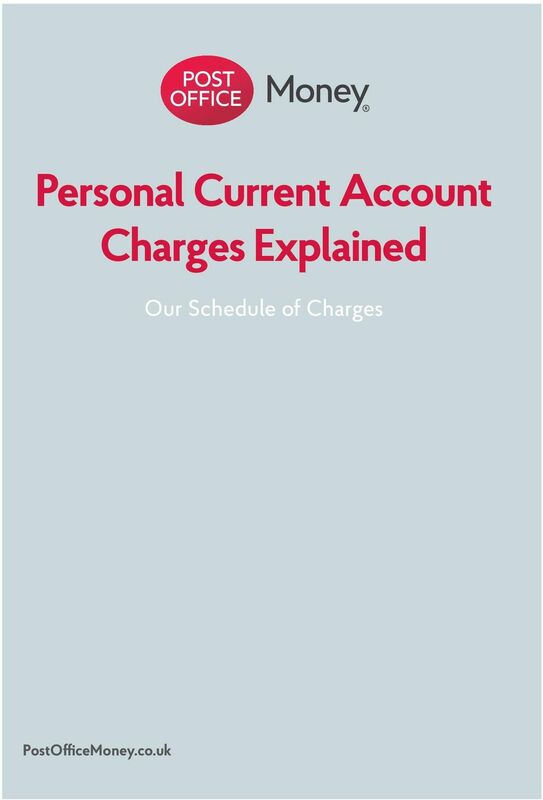 Download "Personal Current Account Charges Explained"
2 This explanatory brochure applies to all three of our Post Office Money current accounts: Control Account, Standard Account and Packaged Account. There are no transaction fees for everyday payments into or out of your current account. This means that if you do not have or use an overdraft you will not have to pay any interest or charges for making everyday use of your account. Product fees We offer three pricing options within our range of current accounts and can help you decide which one is best suited to you. Control Account Standard Account Packaged Account Product fee 5 per month Free 8 per month The monthly fee for the Control Account will usually cover the period from the 5th of one month to the 4th of the next (this is your billing period ). 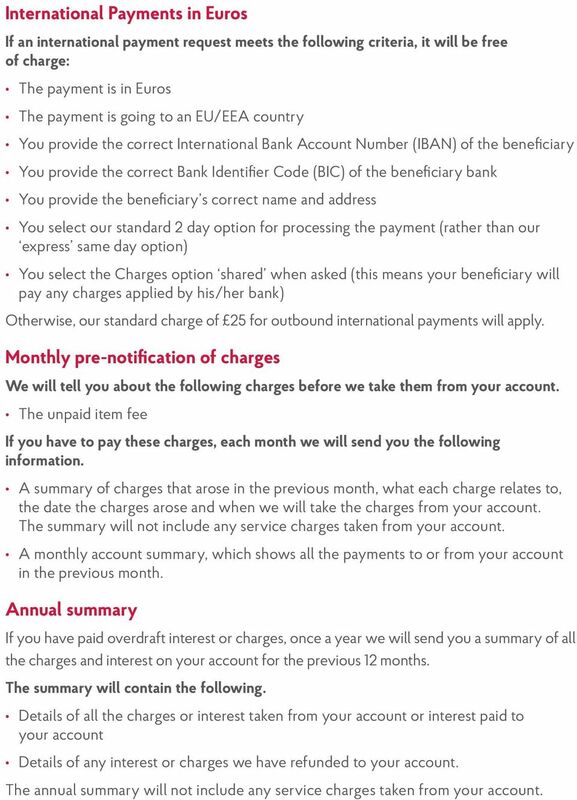 The fee is then subsequently applied to your account at the end of the month. For example, for the period from 5th April to 4th May the 5 fee will be applied to your account at the end of May. If you close your account we will still collect the fee for any completed billing periods but we won t collect a full or partial fee for the period underway when you close. 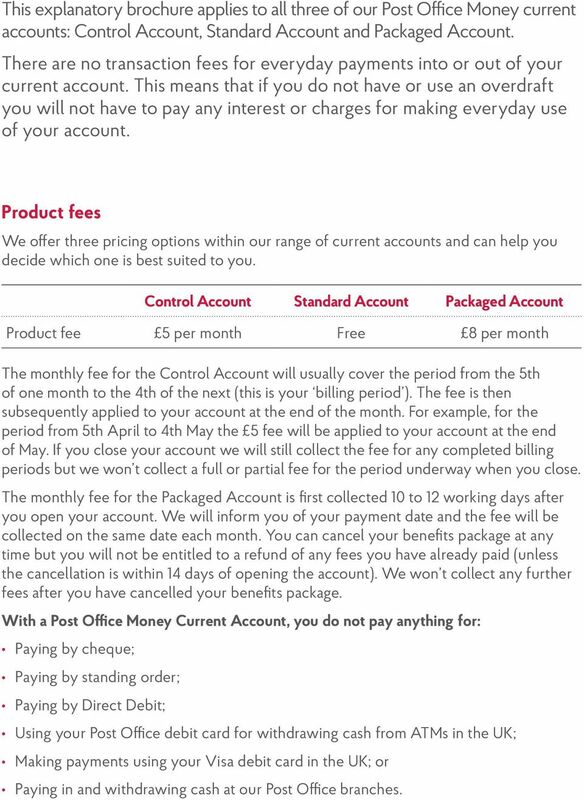 The monthly fee for the Packaged Account is first collected 10 to 12 working days after you open your account. We will inform you of your payment date and the fee will be collected on the same date each month. You can cancel your benefits package at any time but you will not be entitled to a refund of any fees you have already paid (unless the cancellation is within 14 days of opening the account). We won t collect any further fees after you have cancelled your benefits package. With a Post Office Money Current Account, you do not pay anything for: Paying by cheque; Paying by standing order; Paying by Direct Debit; Using your Post Office debit card for withdrawing cash from ATMs in the UK; Making payments using your Visa debit card in the UK; or Paying in and withdrawing cash at our Post Office branches. 4 Service charges These charges are for extra services you ask us to provide and are usually charged at the time we provide the service. We will tell you about the charges when you ask for the service. Control / Standard / Packaged Accounts CHAPS payment (same day money transfer) 21 Replacing a card 6.50 Extra statements (for any more than 12 per calendar year) Copy of a past statement 3 each 6 each^ Balance certificate 6 Interest certificate 6 Stopping a cheque 7.50* Banker s Draft 10 Outside of the UK Control / Standard / Packaged Accounts Non-sterling transaction fee - for buying goods or services abroad with a Visa debit card. 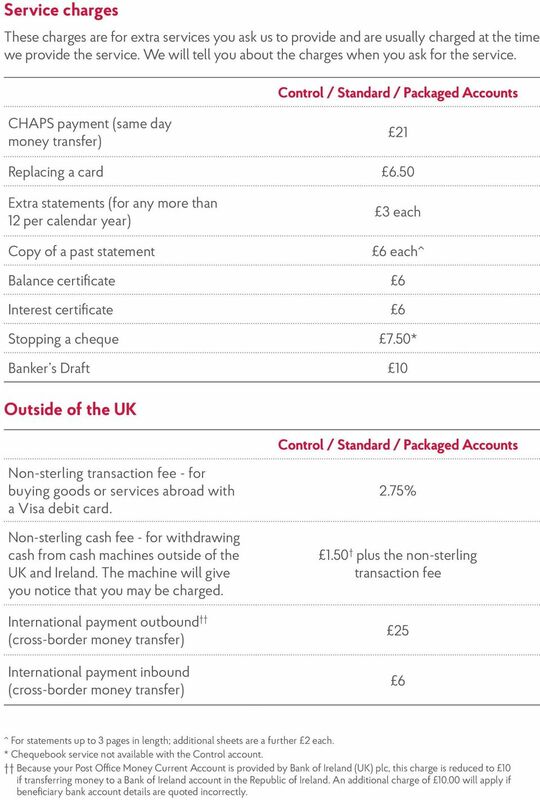 Non-sterling cash fee - for withdrawing cash from cash machines outside of the UK and Ireland. The machine will give you notice that you may be charged. International payment outbound (cross-border money transfer) International payment inbound (cross-border money transfer) 2.75% 1.50 plus the non-sterling transaction fee 25 6 ^ For statements up to 3 pages in length; additional sheets are a further 2 each. * Chequebook service not available with the Control account. Because your Post Office Money Current Account is provided by Bank of Ireland (UK) plc, this charge is reduced to 10 if transferring money to a Bank of Ireland account in the Republic of Ireland. An additional charge of will apply if beneficiary bank account details are quoted incorrectly. 5 International Payments in Euros If an international payment request meets the following criteria, it will be free of charge: The payment is in Euros The payment is going to an EU/EEA country You provide the correct International Bank Account Number (IBAN) of the beneficiary You provide the correct Bank Identifier Code (BIC) of the beneficiary bank You provide the beneficiary s correct name and address You select our standard 2 day option for processing the payment (rather than our express same day option) You select the Charges option shared when asked (this means your beneficiary will pay any charges applied by his/her bank) Otherwise, our standard charge of 25 for outbound international payments will apply. Monthly pre-notification of charges We will tell you about the following charges before we take them from your account. The unpaid item fee If you have to pay these charges, each month we will send you the following information. A summary of charges that arose in the previous month, what each charge relates to, the date the charges arose and when we will take the charges from your account. The summary will not include any service charges taken from your account. A monthly account summary, which shows all the payments to or from your account in the previous month. 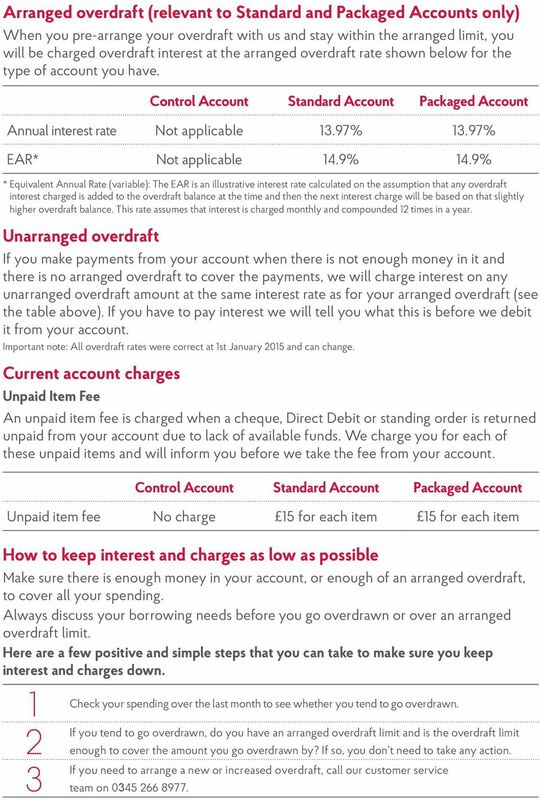 Annual summary If you have paid overdraft interest or charges, once a year we will send you a summary of all the charges and interest on your account for the previous 12 months. The summary will contain the following. Details of all the charges or interest taken from your account or interest paid to your account Details of any interest or charges we have refunded to your account. 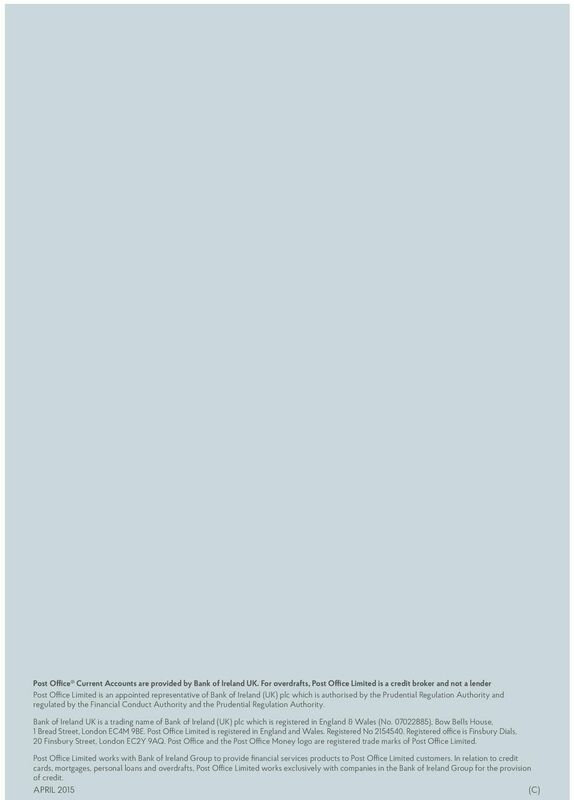 The annual summary will not include any service charges taken from your account.